There is increasing concern with regard to fatal intoxications with prescription opioids and tramadol poisonings. This study aimed to characterise prescribing patterns for tramadol in primary care in France and Germany and identify long-term treatment and potential risk factors for such treatment. Adult patients-prescribed tramadol between January 2006 and June 2016 in GP practices in IMS® Disease Analyzer databases in France and Germany were identified. Six-monthly prevalence and mean doses and durations were calculated by gender, age group and type of tramadol product. The proportion of incident use that resulted in treatment ≥ 366 days was calculated. The odds for long-term treatment was analysed in relation to gender, age group, type of tramadol product, start dose, indication and a diagnosis of abuse or misuse. Overall prescribing of tramadol decreased in Germany and increased, then plateaued in France. Prescribing was higher in females. Predominantly prescribed products were tramadol in combination with paracetamol (COMB) in France and slow release formulations of tramadol (SR-TRAM) in Germany. SR-TRAM had the highest mean doses and durations, followed by immediate release formulations of tramadol (IR-TRAM) and COMB. Around 1.5% of incident tramadol use in France and 8.2% in Germany resulted in long-term treatment. Long-term treatment was associated with increasing age, SR-TRAM and a diagnosis of abuse or misuse. The risk of long-term treatment appeared to increase with increasing age. Potential risk factors for long-term treatment included initiating treatment with SR-TRAM and a diagnosis of abuse or misuse. The online version of this article ( https://doi.org/10.1007/s00228-018-02622-9) contains supplementary material, which is available to authorized users. Tramadol is a weak opioid analgesic indicated for the treatment of moderate to severe pain. The analgesic effect is mediated by binding to opioid receptors and inhibition of serotonin and norepinephrine reuptake . The active metabolite o-desmethyltramadol , which is formed by the polymorphic enzyme CYP2D6 [3, 4], and not tramadol itself, is responsible for its opioid effects. Tramadol is regarded to have a low potential for abuse and misuse, and is therefore not scheduled in the German Narcotic Drugs Act  nor in the French decree on narcotics  in contrast to some other countries such as the UK. 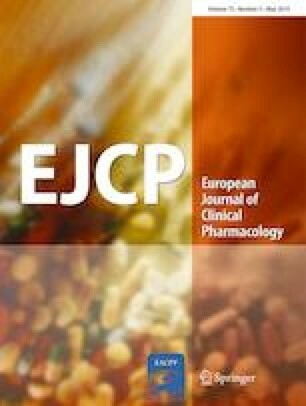 The study aimed to characterise trends in tramadol prescribing in primary care in two large EU countries which have not scheduled tramadol as a narcotic, during a 10-year period between 1 January 2006 and 30 June 2016, including six-monthly estimates of prevalence, and intended doses and durations in tramadol prescriptions. A further aim was to estimate the proportion of patients starting treatment with tramadol that continue treatment for 12 months or longer and may be at increased risk of developing abuse or dependence. Long-term opioid treatment has not been consistently defined in the literature . Our goal was to capture patients that continue treatment beyond a minimum of 3–6 months typically required to fulfil the definition for chronic pain . We hypothesised that the risk of long-term treatment could be influenced by age, gender, dose, the type of tramadol product prescribed, indication for treatment and a history of abuse or misuse, and that similar factors could also influence doses and durations in individual prescriptions. The study used French and German primary care electronic health record data from IMS® Disease Analyzer (October 2016 release). Tramadol prescribing in patients 18 years or older was studied in general practices that continuously provided data over a 10-year period from 1 January 2006 to 30 June 2016. Both databases contain a representative panel of general practitioners (GPs) and cover around 2% and 3% of all GP practices in France and Germany, respectively. The age and gender distribution of adult patients included in the databases is representative of the general population [20, 21]. The databases contain information on diagnoses and prescriptions, and data from Germany also contain information on lifestyle factors. In both countries, patients are not required to register with a GP to receive care. Therefore, denominators for prevalence calculations are based upon patients consulting at GP practices within the specified time periods, i.e. active patients, and not the entire population denominator. All products containing tramadol were included in the study. The IMS Disease Analyzer databases in Germany and France use EphMRA ATC codes for classification. All tramadol containing products are classified as EphMRA ATC code N02B0. We considered the following categories or types of tramadol products: tramadol in combination with paracetamol, immediate release (IR) formulations of plain tramadol (all plain tramadol formulations excluding slow release formulations) and slow release (SR) formulations of plain tramadol. Prescription records in IMS® Disease Analyzer contain information about the prescribed product or substance, including the strength and pack size where available, and information about the amount prescribed. In France, information about the daily dose, frequency of intake, prescribed quantity (number of packs) and duration is extracted by IMS® from an unstructured ‘physician dosage instruction text’. In Germany, the prescribed quantity is provided directly by the physician. Information about the daily dose is extracted by IMS® from a free text field. Duration is then calculated by IMS® from the daily dose and the prescribed quantity. We did not include liquid formulations in calculations of intended doses and durations due to limited information allowing dose or duration to be reliably estimated. These formulations represented 2% of tramadol prescriptions in adult patients in France and 27% in Germany. Intended daily doses and durations in individual prescriptions were calculated, where possible. Multiple same day prescriptions for a patient were considered together; total doses were summed and the prescription with the longest duration was selected as duration. Daily dose was calculated only if information on dose was available in all prescriptions on the same date. The mean dose and mean duration in all prescriptions for the patient during the study period was calculated. Prescriptions were then ranked by date of prescription, and the first tramadol prescription during the study period was defined as incident or prevalent exposure. Incident tramadol exposure was defined as a prescription for tramadol in a patient with at least 365 days of observation with no prescription within the previous 365 days. Individual prescriptions were combined in order to calculate the total treatment duration following incident exposure. Treatment was considered to belong to the same treatment episode until there was a gap of more than 30 days between calculated treatment dates. End of exposure was defined as the date for the previous prescription, plus its duration. Tramadol prescriptions with a gap of 366 days or more instead represented a new treatment episode and were considered as new incident exposure. In order to reduce the risk of incorrect classification of the exposure as short-term, we censored total treatment durations of less than 366 days if the patient had no further prescriptions for tramadol, considering the possibility that the patient may have continued treatment in another practice, which could not be identified in the database. The mean duration of prescriptions for the same treatment episode was imputed if duration was missing and at least one of the prescriptions in that treatment episode had data to calculate the duration. A sensitivity analysis was undertaken using only patients with complete prescription duration data. Due to a low percentage of incident prescriptions with data on duration in Germany (23% of all prescriptions), a further sensitivity analysis was performed imputing the median duration of all available prescriptions in all patients according to the type of tramadol product in case of missing data on duration among all prescriptions for the same treatment episode. To increase the validity of exposure data, daily doses (France and Germany) and duration (France only) recorded by IMS® were reviewed against data contained within physician free text fields of the prescription. Durations of single prescriptions greater than 365 days were considered incorrect and were excluded from the analysis (0.02% of prescriptions in France and 0.0002% of prescriptions in Germany). In order to investigate risk factors for long-term tramadol use, clinical diagnoses were identified by screening ICD 10 diagnosis codes recorded on the same day as the incident tramadol prescription, excluding ICD codes Z70.0 to Z76.9 (i.e. persons encountering health services in other circumstances). The most common ICD 10 codes comprising 0.5% or more of all tramadol prescriptions were reviewed by two clinical investigators, to categorise indications for tramadol. Furthermore, ICD-10 codes suggestive of abuse and misuse [22, 23, 24, 25, 26] recorded up to the time of the incident tramadol prescription were also identified and included the following: F10.0-F10.9 Mental and behavioural disorders due to use of alcohol; F11.0-F11.9 Mental and behavioural disorders due to use of opioids; F12.0-F12.9 Mental and behavioural disorders due to use of cannabinoids; F13.0-F13.9 Mental and behavioural disorders due to use of sedatives or hypnotic; F14.0-F14.9 Mental and behavioural disorders due to use of cocaine; F15.0-F15.9 Mental and behavioural disorders due to use of other stimulants, including caffeine; F16.0-F16.9 Mental and behavioural disorders due to use of hallucinogen; F18.0-F18.9 Mental and behavioural disorders due to use of volatile solvents; F19.0-F19.9 Mental and behavioural disorders due to use of multiple drug use and use of other psychoactive substances; Z50.2 Alcohol rehabilitation; Z50.3 Drug rehabilitation; Z71.4 Alcohol use counselling and surveillance; Z71.5 Drug use counselling and surveillance; Z72.1 Alcohol use and Z72.2 Drug use. The prevalence of tramadol prescribing was calculated using six-monthly time periods, examining trends by gender, age group (18–29, 30–39, 40–49, 50–59, 60–69, 70–79, 80–89 and 90–99 years) and type of tramadol product. The numerator for these calculations included patients with a tramadol prescription, and the denominator included all patients with a consultation, respectively, during each time period. In a post-hoc analysis, Joinpoint regression using the grid search method and permutation testing for model selection was used to determine at what point statistically significant changes in trend for prevalence of tramadol prescribing occurred . Doses and durations in individual prescriptions were analysed by incident or prevalent use at the start of the study, and by gender, age group, type of tramadol product, total number of tramadol prescriptions during the study period (1–9, 10–49 and ≥ 50 prescriptions) and year at the start of the study. Doses were also analysed by prescription rank until fewer than 100 patients had received as many or more prescriptions during the study period. Long-term treatment was defined as a continuous treatment episode of 366 days or longer. Risk factors for long-term treatment vs. shorter treatment duration were investigated using multivariable logistic regression and calculating adjusted odds ratios (ORs) for long-term treatment for the following baseline variables: gender, age group, type of tramadol product, starting dose, clinical indication and a recorded history of ICD codes suggestive of abuse or misuse. Sensitivity analysis was performed, excluding from the reference group patients with evidence of continued tramadol use for at least 181 days during the first 365 days after the incident exposure, irrespective of whether gaps of 31 days between prescriptions had occurred. Additional sensitivity analysis was performed, excluding from the reference group patients with episodes of long-term use after the initial short-term treatment episode and prior to any subsequent incident exposure. All analyses in the study were own analyses based on data available in the IMS® Disease Analyzer databases. Trends in prevalent prescribing of tramadol by gender in GP practices in France and Germany are shown in Fig. 1. In both France and Germany, prescribing was higher in females compared with males. Prescribing increased with increasing age (Supplementary material, Fig. A1). Compared to France, the prevalence of tramadol prescribing in Germany fell during the entire study period (Fig. 1). A significant change in trend resulting in decreased prescribing was identified in France but not in Germany (Supplementary material, Table A1). In France, the most commonly prescribed tramadol type was tramadol in combination with paracetamol (59.7% of total, Fig. 2), which showed a similar trend as the overall tramadol prescribing, followed by plain tramadol SR formulations, then plain tramadol IR formulations until 2014, when plain tramadol IR formulations became more frequent than SR formulations. The changes in trend during 2014 for plain tramadol IR and SR formulations were both significant (Supplementary material, Table A1). In Germany, the most commonly prescribed type was plain tramadol SR formulations (56.1% of total, Fig. 2), followed by plain tramadol IR formulations and tramadol in combination with paracetamol. Significant decreases in trend were observed for all three tramadol types, with an earlier change for tramadol combinations that was later followed by significant increase in trend (Supplementary material, Table A1). Daily dose was calculated in 77.4% (n = 244,006) and duration in 90.8% (n = 286,292) of all tramadol prescriptions in France (n = 471,839) compared to only 19.7% (n = 93,084) and 20.0% (n = 94,516) of all tramadol prescriptions (n = 315,433) in Germany. Initial and mean doses and mean durations by incident or prevalent use at study start, gender, age group, type of tramadol and total number of tramadol prescriptions during the study period are shown in Tables 1 and 2. For initial and mean doses and mean durations by year at start, please see Supplementary material (Table A2). In both countries, doses and durations in tramadol prescriptions were greater in prevalent compared to incident users (Tables 1 and 2). The highest doses were prescribed to males and those in the middle age groups. Dose and duration was higher for plain tramadol SR formulations, followed by plain tramadol IR formulations then tramadol in combination with paracetamol, whilst patients initiating treatment with more than one tramadol formulation type had the highest doses and durations. In general, mean daily doses increased with increasing number of repeat prescriptions (Fig. 3). The findings were largely driven by non-incident users at the time of the first tramadol prescription during the study period and plain tramadol SR formulations. Clinical indications were identified in 72.1% and 80.2% of patients initiating tramadol in France and Germany, respectively. The most frequent indication for tramadol prescribing was ‘dorsopathy’, followed by ‘arthropathies’ and ‘injuries’ (Supplementary material, Table A3). The prevalence of long-term use following tramadol initiation was 1.5% in France and 8.2% in Germany. Risk factors for long-term treatment are shown in Table 3. Long-term treatment was associated with increasing age, a history of ICD codes suggestive of abuse or misuse and treatment with plain tramadol SR formulations. In Germany, a clinical indication of ‘pain not elsewhere classified’, and in France other clinical indications than those that had been classified in the study were associated with long-term treatment. There was no strong evidence that any of the other classified clinical indications were associated with long-term treatment whilst a history of ‘dorsopathy’ was associated with a reduced risk of long-term treatment. Results were similar for the pre-specified sensitivity analyses. Our study found that tramadol prescribing was more prevalent in females, and increased with increasing age whilst higher doses were prescribed more often to males and people in their middle ages. The prevalence of tramadol prescribing appeared to have fallen in Germany compared to France. Results from Germany are in keeping with a previous study using German insurance data that showed a decrease in the prevalence of prescribing of plain tramadol IR formulations by 39.6% and an increase in prescribing of plain tramadol SR formulations of 102.7% between 2001 and 2010 . Mean daily doses of tramadol appeared to steadily increase with increasing number of prescriptions received by patients during the study period. Tolerance and physical dependence are expected effects of opioids , resulting in a need to increase the dose up to ten times the original dose to maintain the same analgesic effect. In a review of spontaneously reported cases with tramadol dependence, prescribed doses had ranged up to 800 mg per day with ingested doses up to 4000 mg per day , and in a published case report, a young woman with a history of depression had increased the dose of tramadol, which improved mood and produced euphoria . Development of tolerance is one of several criteria for opioid use disorder according to DSM 5 , although most patients with tolerance do not develop opioid addiction . A worsening of the underlying chronic pain condition may, however, also explain some of the observed dose increases. The prevalence of long-term prescribing following tramadol initiation was 1.5% and 8.2% in France and Germany, respectively, although in Germany, the result was based on a smaller proportion of incident use where duration could be calculated (23% vs. 92%). The proportion of patients with long-term treatment in Germany was similar to the results from a previous study of opioids using data from IMS® Disease Analyzer in Germany . Risk factors for long-term treatment appeared to include increasing age, a history of abuse or misuse and treatment with plain tramadol SR formulations. In Germany, a clinical indication of unclassified pain was also associated with long-term treatment, whereas in France, a clinical indication other than those that had been classified in the study appeared to be associated with long-term treatment. One potential reason for the lower prevalence of long-term use in France may be the predominant prescribing of tramadol in combination with paracetamol in France in contrast to Germany, where plain tramadol SR formulations was most commonly prescribed, as tramadol in combination with paracetamol was associated with a significantly lower likelihood of long-term use compared to plain tramadol SR formulations. However, initiating treatment with plain tramadol SR formulations may be due to anticipated long-lasting conditions, thus increasing the likelihood of longer-term treatment if well tolerated. This bias may not have been sufficiently controlled for by including the most common indications for tramadol treatment in the analysis. An association between long-term treatment and a diagnosis of unclassified pain in Germany is consistent with findings from a previous study, which suggested that unexplained pain tended to be persistent . Complex regional pain syndrome, fibromyalgia and visceral pain problems may underlie a diagnosis of unclassified pain . A diagnosis of unclassified pain has been shown to be associated with high rates of outpatient and emergency department visits . In light of reports of tramadol abuse occurring when used for periods longer than weeks to months [7, 8], particularly in case of high doses, this study was conducted to examine trends in tramadol prescribing in France and Germany and identify risk factors for long-term use. This is important because drug-related opioid deaths have been shown to increase with increasing number of problem opioid users . We considered that it is relevant to study patients that initiate treatment with tramadol and continue for more than 1 year as well as patients that have a high number of prescriptions for tramadol in order to gain more insight into potential problem opioid use of tramadol. The factors that we identified as risk factors for long-term use, i.e. increasing age, plain tramadol SR formulations and a history of abuse or misuse have previously been identified as factors that increase the risk of opioid overdose , and a history of abuse or misuse has been previously identified as a factor that increases the risk of opioid addiction . Results are also in keeping with an increase in chronic pain with increasing age . We did not, as we had expected, identify an association between the tramadol dose and the risk of long-term use independent of the tramadol formulation. However, as the dose differed between tramadol types, and was higher for plain tramadol SR formulations, which was associated with a higher risk of long-term use, compared to the other two tramadol formulations, it is possible that the identified increased risk of long-term use with plain tramadol SR formulations was at least in part due to a higher dose for this formulation. It is also possible that the increased risk of opioid overdose with the use of high opioid doses  relates more to dose increases during treatment than to the starting dose itself. This study uses large electronic health care databases with a high level of granularity of data on prescribing to examine patterns of tramadol prescribing and risk factors for long-term use in two major European countries. However, our study has several potential weaknesses. Not all of our results were consistent between data sources, which may relate to differences in health care practices, quality of data recording, power for analysis and ability to accurately follow up patients over time. The latter may potentially lead to an underestimation in the prevalence of long-term use, although we tried to minimise this risk by censoring total treatment durations of less than 366 days if the patient had no further prescriptions for tramadol. For some patients, tramadol prescription data was incompletely recorded; however, sensitivity analyses were conducted using different definitions with similar results. A comparatively high proportion of prescriptions in Germany, 27% vs. 2% in France, concerned liquid formulations that were not included in the calculation of duration. Our results may not, therefore, be representative for patients treated with liquid formulations of tramadol. Overall, duration could only be calculated in 23% of all incident use in Germany vs. 92% in France, making results from Germany more susceptible to potential biases. A further limitation of the study includes the possibility that diagnoses may be incompletely recorded. Hence, the associations between the indication for treatment or a history of ICD codes suggestive of abuse or misuse and long-term tramadol treatment may be underestimated. Moreover, since the study is based on prescriptions, it is unknown to what extent the patients have actually visited the pharmacy to dispense the treatment. Lastly, it is uncertain how our results are generalizable to other countries in Europe and beyond. Tramadol abuse may occur [7, 8] if used for long periods at high doses. Male patients, middle aged patients and those receiving large number of prescriptions have the highest doses, whilst increasing age, a history of conditions associated with abuse or misuse and initiation of treatment with plain tramadol SR formulations were identified as risk factors for long-term use suggesting these types of patients could be targeted for medication review and may be at increased risk of tramadol abuse. In Germany, a diagnosis of unclassified pain was also associated with long-term use. Further evidence is required to determine whether the tramadol SR formulation itself is a risk factor for long-term use independent of the dose or indication for treatment. The authors would like to thank EMCDDA for sharing their emerging concern about misuse and fatal intoxications of tramadol in the context of poly-drug use. The authors are employees of the European Medicines Agency and have no conflicts of interest in relation to this article.